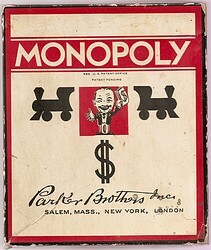 In 1935, Parker Brothers (PB) bought the rights to Monopoly from the 'inventor', Charles Darrow. This included Darrow's inventory of game parts. 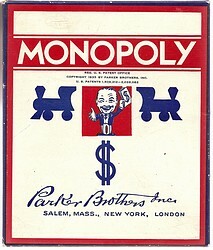 PB immediately began selling Monopoly games using the Darrow game parts. 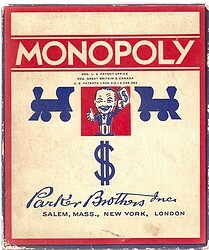 The first games Parker Brothers made were marked TRADE MARK. About 24,000 - 25,000 of these were maunfactured. This included a small number of the No 9 long box, very rare today. 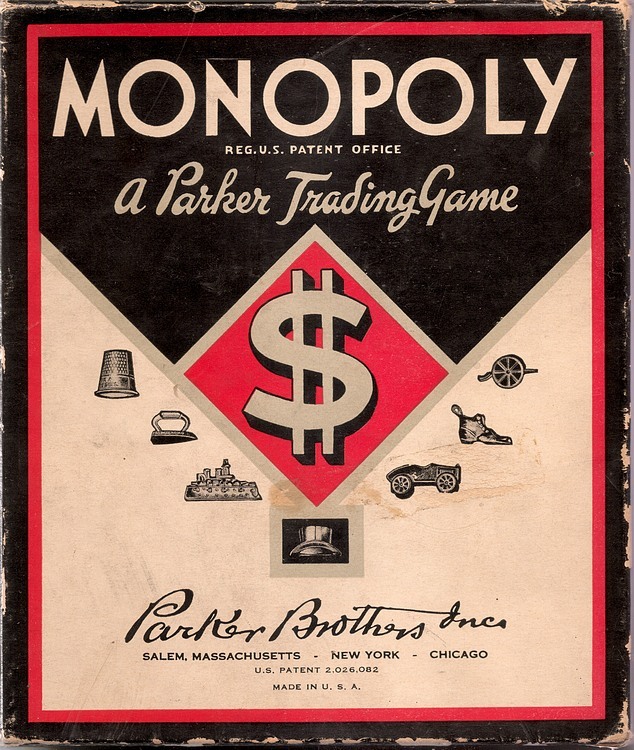 Parker Brothers applied for their own patent and the next group of their games stated PATENT PENDING or PATENT APPLIED FOR. Over 100,000 games were produced with this label. This statement was used for a while in 1935, but they discovered that there were other games very much like Monopoly already with patents. 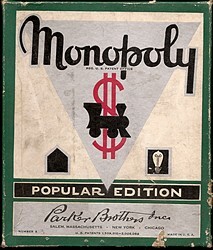 To protect their investment in Darrow's Monoply game, they decided to purchase the 1924 patent to the Landlords game and added that patent to their Monopoly games. This is patent 1,509,312. In the meantime, PB applied for their own patent on Monopoly. Their patent was issued on Dec 31, 1935, patent number 2,026,082. 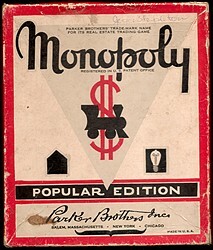 The new patent was added to the labels and games produced from 1936 - 1941 included both patents printed on the labels. When the 1924 patent expired in 1941, they dropped that number from the labels and used only the later patent issued to them. 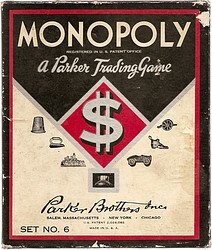 The phrase A PARKER TRADING GAME was added to the box tops in 1937. 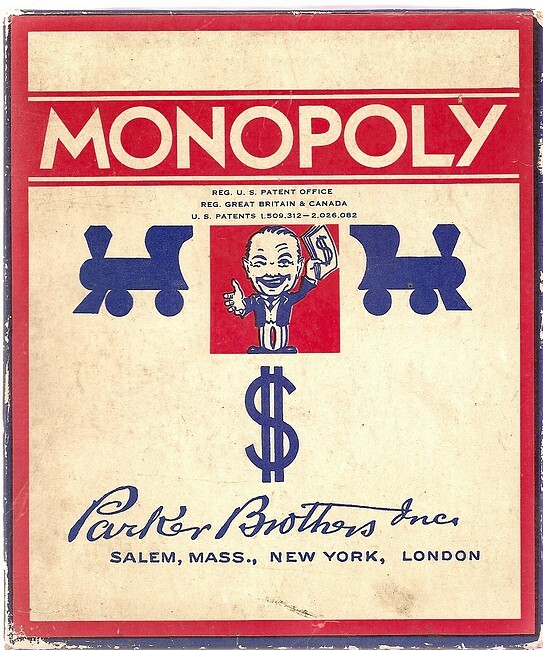 Parker Brothers had an office in London and included this city on the labels of their Monopoly games. That office closed in 1940 and London was replaced by Chicago. Dating early Monopoly games is done by the patent numbers and cities listed on the labels. Most early games can be dated within a few years using these label elements. 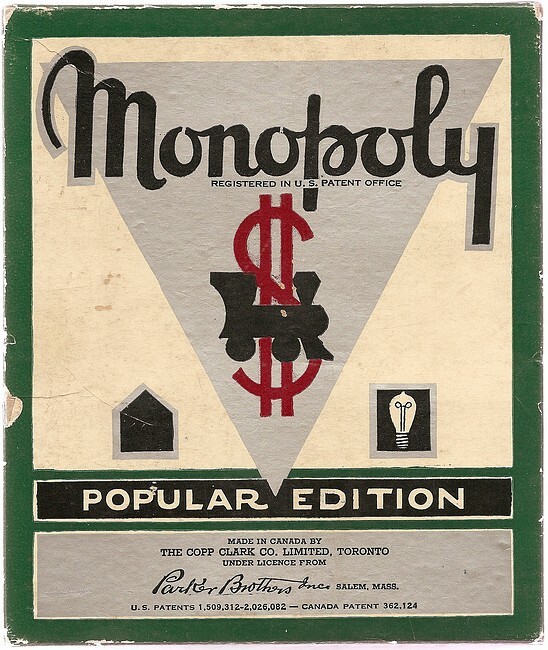 Canadian Monopoly games were introduced in 1936 and closely resembled the U.S. games with the different varieties. The earliest known Canadian game is the No 9 White Box with legals stating CANADIAN (Trademark) REGISTRATION APPLIED FOR and CANADIAN PATENT APPLIED FOR, described below. These seem to be extremely rare. The game boxes pictured below show different label designs and kind of a chronology of manufacture. I'm always adding new box varieties so check back once in a while for updates. Please feel free to email me with corrections, questions, or comments. Also, check out the online Vintage Monopoly Game Collectors group here. 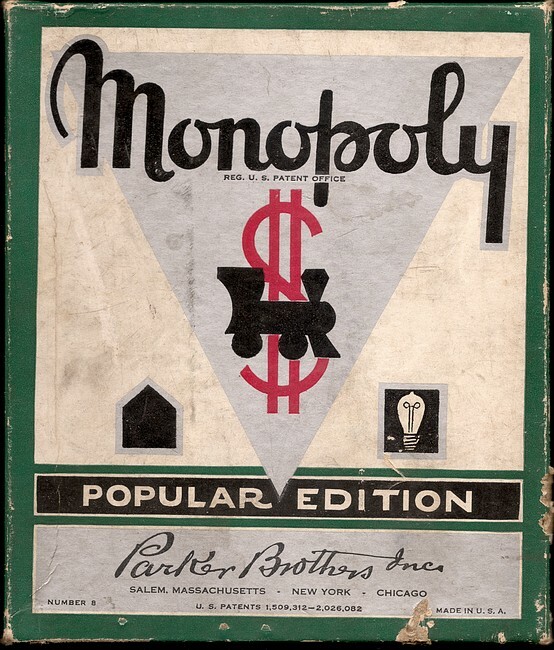 Lots of good stuff there about early Monopoly games. 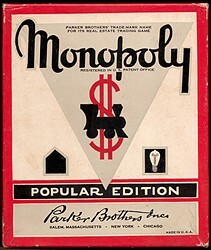 This style box was a Darrow design and Parker Brothers just continued production using his design. 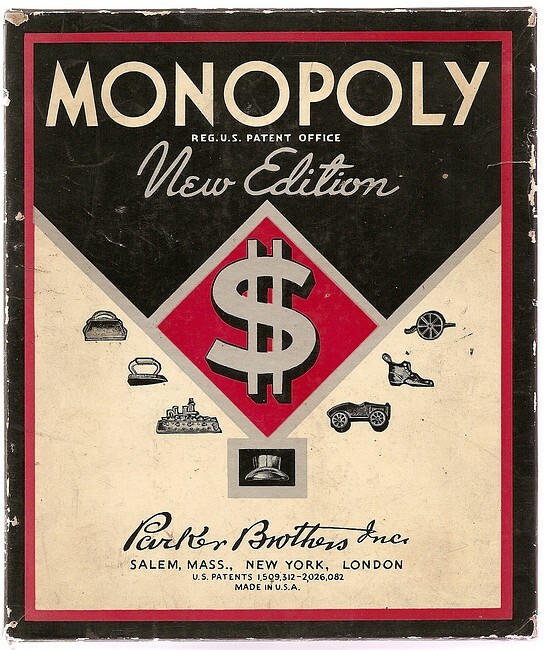 Once Parker Brothers figured out Monopoly was taking off, they decided to offer a variety of different game options. One of the first things changed was the color of the box from black to blue. By the end of 1936, all the boxes with this label design were switched to the blue color. 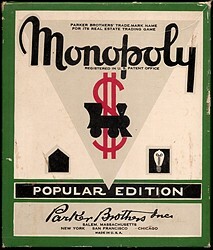 BLACK BOX The 'Trade Mark' game is the ultimate Parker Brothers Monopoly game for a collector. It is the first to be wholly manufactured by Parker Brothers and is very similar to the Darrow version, except for the addition of player pieces and a redesign of Darrow's black box. It was produced in limited numbers for only a few months in mid-1935. Estimates are that about 24,000 games might have been produced. The 'Trade Mark' version was also produced in the long box No 9 version. Sorry, no pictures of that one available (yet). 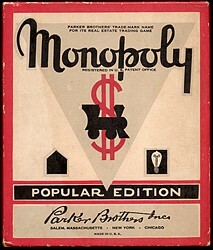 BLACK BOX The 'Patent Pending' game was Parker Brothers next version of Monopoly, made after the 'Trade Mark' games. Parker Brothers applied for a patent and added this to the games. By this time, Parker Brothers realised the game was going to be a hit so production was ramped up considerably. It is estimated that over 100,000 'Patent Pending' games could have been made. No Number 9 White Box games are known with the PATENT PENDING statement on the box. 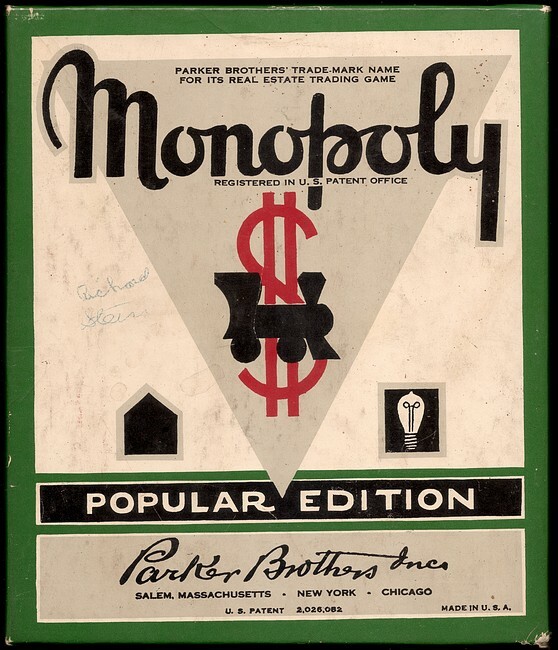 BLACK BOX On Dec 31, 1935, Parker Brothers was issued a patent for Monopoly, patent 2,026,082. Almost immediately, very early in 1936, this new patent was added to the Magie patent on all Monopoly games, replacing the single Magie patent. 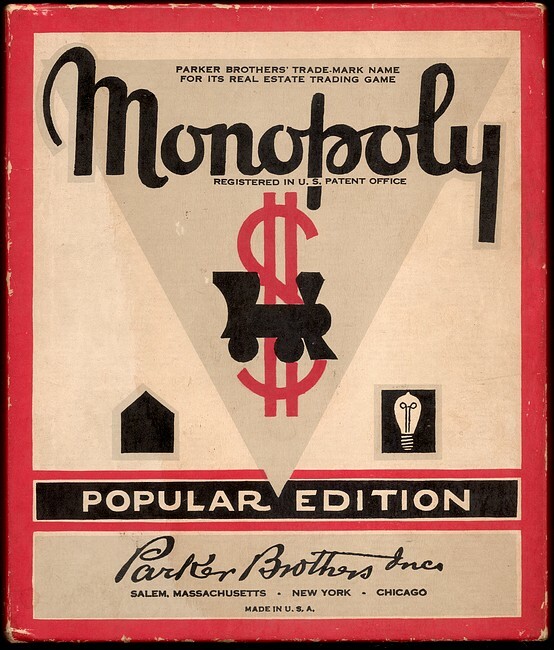 These patents also appeared on the several new varieties introduced by Parker Brothers throughout 1936. These patents remained on all Monopoly games until 1941 when the Magie patent expired and was removed. 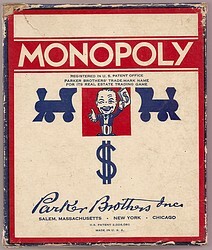 COPYRIGHT 1935 1936 was a busy year for Parker Brothers and their Monopoly game. They produced 1.8 million copies of the game and introduced several different new versions of the game. The Number 7 game box was changed from black to blue. Also, Parker Brothers was issued their own patent for Monopoly on Dec 31, 1935 and they wanted the world to know about it, so they printed that on these game boxes. 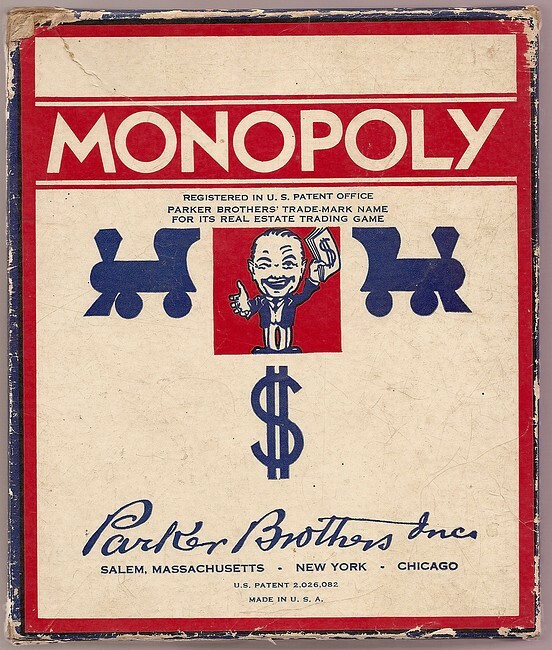 MADE IN USA Late in 1936, Parker Brothers realized that Monopoly was going to be their best seller and drafted a marketing plan to promote the game. 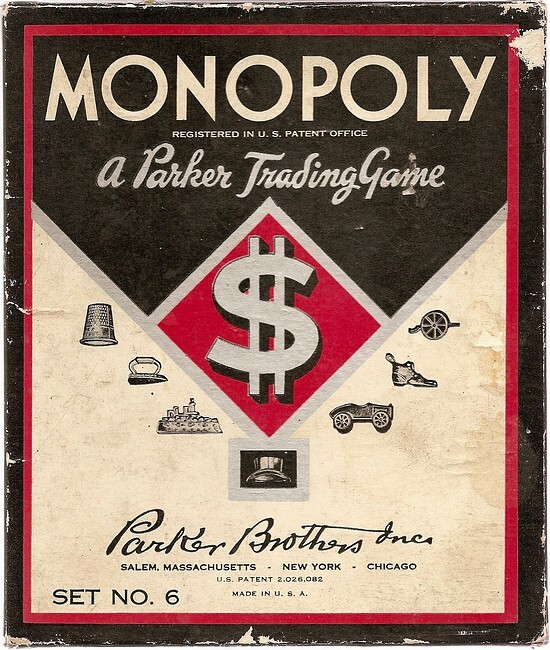 Someone came up with the phrase 'A PARKER TRADING GAME' and added that to game boxes late 1936. By early 1937, all Monopoly games included this wording. The words 'MADE IN USA' were added at the bottom of the box. (For 3 to 8 Players) Another promotional idea was to introduce the Number 5 game, pretty much the same as the Number 7 game, except there were 8 player pieces instead of 7 AND it cost 50c more. They printed these changes on the first Number 5 game boxes. 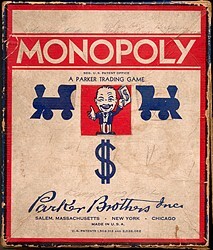 Also, Parker Brothers sold licenses to sell Monopoly to a Canadian and a British company in 1936. They added that bit of information to the legals statement. 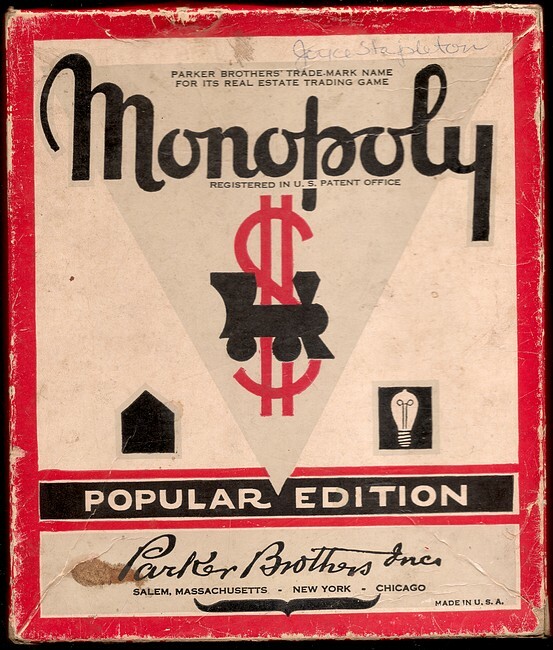 REG GREAT BRITAIN & CANADA Didn't take long for Parker Brothers to realize raising the price of their game in the middle of the Great Depression was a bad idea, so the game went back to $2.00 and the promotional printing was removed, though Monopoly was still their best selling game. 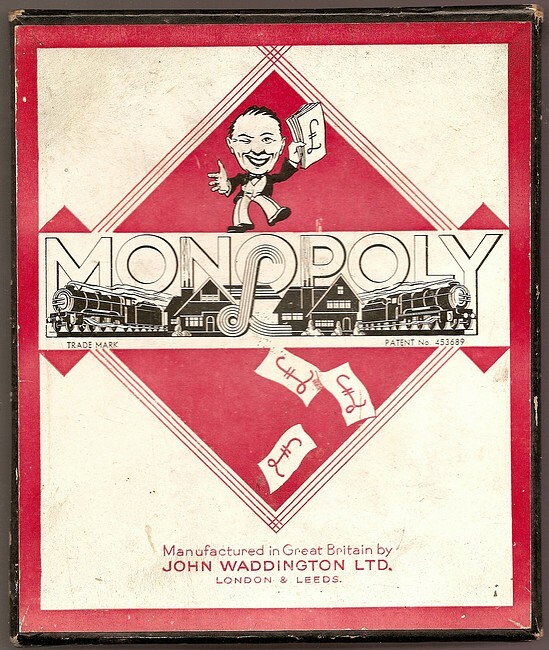 LONDON By 1937, the bit about being reg in Great Britain and Canada had been removed and 'A PARKER TRADING GAME' took a prominent position in the legals line and was printed in bold text. 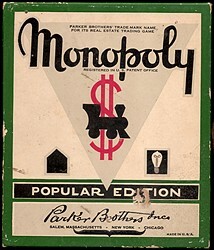 This is about the most common variety of 1930s Monopoly. 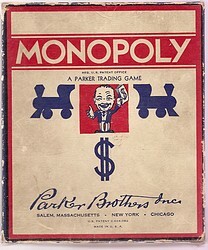 CHICAGO In 1940, Parker Brothers closed their office in London and removed the city from the box. This was replaced by Chicago. This is a very hard to find variety, with Chicago AND the dual patent because the Magie patent (1,509,312) expired in 1941 and had to be removed, so this version was only printed in 1940. REG. In 1941, the Magie patent expired and was removed from the game boxes. REGISTERED In 1946, the text 'REG. U.S. PATENT OFFICE' was expanded, thus: 'REGISTERED IN U.S. PATENT OFFICE'. 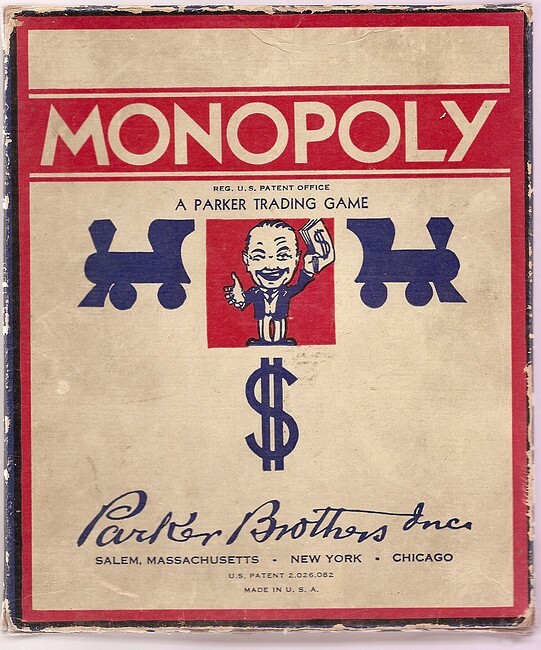 "PARKER BROTHERS TRADE-MARK NAME FOR IT'S REAL ESTATE TRADING GAME" added In 1951, 'A PARKER TRADING GAME' was replaced with 'PARKER BROTHERS TRADE-MARK NAME FOR IT'S REAL ESTATE TRADING GAME'. As far as I can tell, this was the last version of the Number 7 game. It was discontinued in 1952 and was wholly replaced by the Number 8 Popular Edition as the only small box game being made. 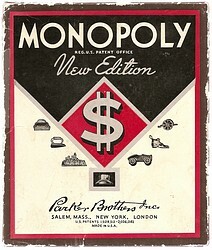 The NEW EDITION game was Parker Brothers first new label design. There are 2 versions of this game, the brown box and black box versions. The brown box version was first, but didn't last very long before Parker Brothers chose to go with the black box version. I believe Parker Brothers found the brown boxes were too hard to come by. The New Edition games are very hard to find. On Ebay, only 1 in 20 New Edition games are the brown box version, and the matching brown boards are even harder to find. Also, only about 1 in 20 of the games offered with this label say New Edition, the rest say A PARKER TRADING GAME. Conclusion - the black box and board is scarce, the brown box version is very scarce, and the brown New Edition board is rare. 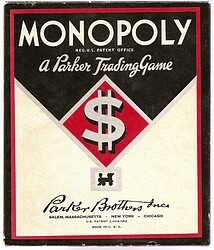 In 1937, Parker Brothers added A PARKER TRADING GAME and the NEW EDITION title was gone. Some believe production of this game with the metal player pieces was suspended during WWII and this box, with the metal player pieces removed from the label and wooden play pieces added to the game, was a concession to the shortage of strategic materials/metals. When production of games with metal play pieces resumed after the war, it included a different style cannon than the one pictured on the label, and also a different version of the car. After the war, metal for game tokens was available and the old token pictures were once again added to the box tops. Problem was, the molds used to make the cannons were not available and it was replaced with a more modern howitzer style cannon and the shoe was replaced with a cowboy on a rearing horse. The older style car now has a driver, too. Parker Brothers chose to make yet another version of Monopoly, the POPULAR EDITION, game designation Number 8. This was offered along with the Diamond $ boxes and the first Blue Boxes. This version originated with the same small sized boxes as the other 2 types. A lot of thought went into the design of this box. It was made from 1936-1954. The first of these had a green border. In the early 1950s, Parker Brothers added a red border box, as well. Dual Patent, London This was the first version of the Popular Edition. It had both the Magie (1,509,312) and the Parker Brothers (2,026,082) patents and included London in the list of cities. 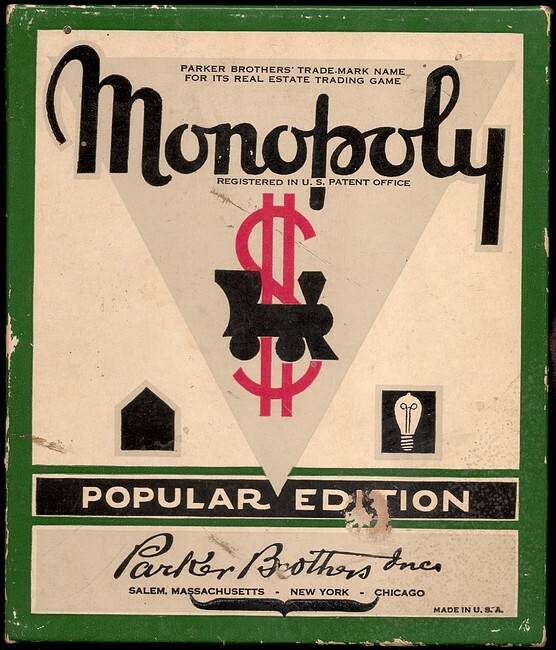 In addition, it had 'NUMBER 8' game designation was printed on the box, letting folks know this was a different version of Monopoly. This configuration was used until 1940. 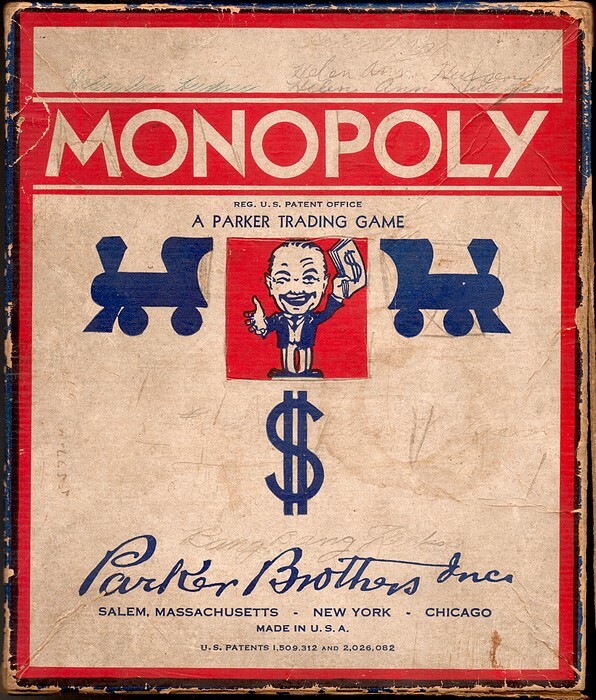 Dual Patent, Chicago In 1940, Parker Brothers dropped London from the list of cities and added Chicago. Not much else was changed. Single patent, Chicago In 1941, the early Magie patent expired and it was removed from the legal description. Also, the game designation 'NUMBER 8' was removed. In 1949, the REG U.S. PATENT OFFICE statement was changed to REGISTERED IN U.S. PATENT OFFICE. 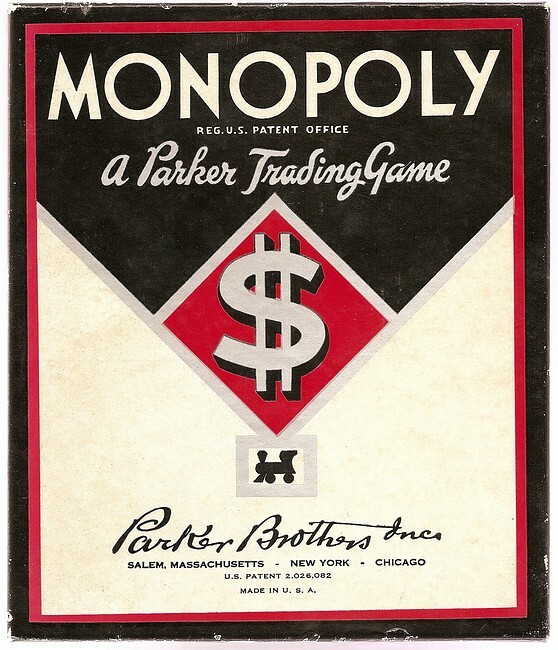 In 1951, 'PARKER BROTHER'S TRADE MARK NAME FOR ITS REAL ESTATE TRADING GAME'. These modifications are present on this box. 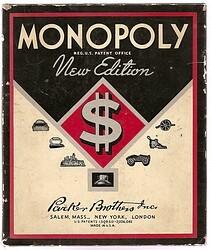 Also, in 1951, Parker Brothers introduced a new version of the Popular Edition with a red trimmed box. They were sold along side the green box versions. 'moustache'. 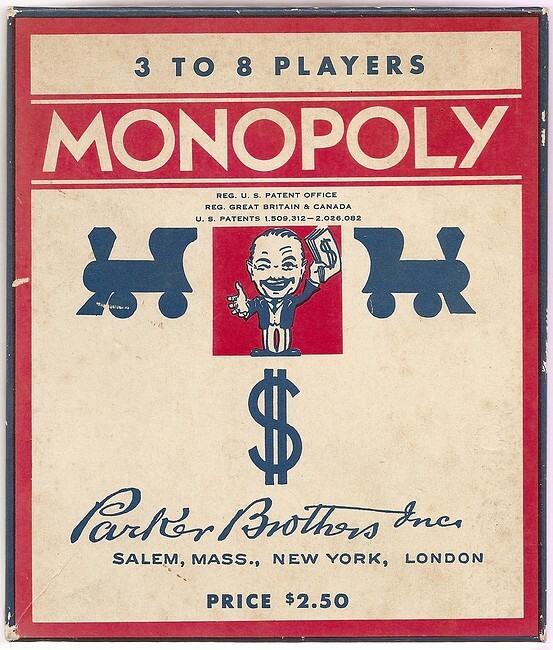 The Parker Brothers patent (2,026,082) expired on Dec 31, 1952 and they were no longer allowed to use that number on their games, but there was still a significant inventory of box labels already printed up with that number. They decided to reprint a 'moustache' over the expired patent and use them anyway. These are a bit hard to find, though not impossible. The first batch made in 1953 used these labels until they could get the revised labels printed up. MADE IN USA on right The second variety for 1953 shows the first printing without the patent and MADE IN USA is still off to the right. MADE IN USA centered. The third variety for 1953 has MADE IN USA centered, where the patent used to be. San Francisco added. In 1954, San Francisco was added to the list of cities. 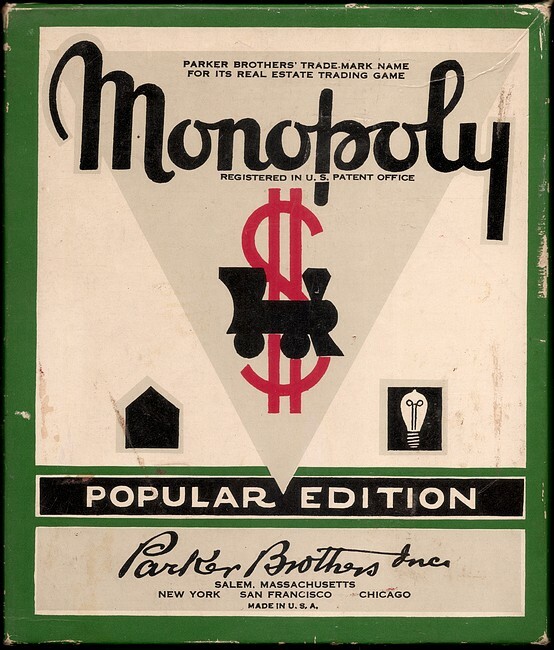 As early as 1936, Parker Brothers had sold licenses to sell Monopoly in other countries. The first were in Great Britain to John Waddington Printing and Canada to the Copp-Clark Company. 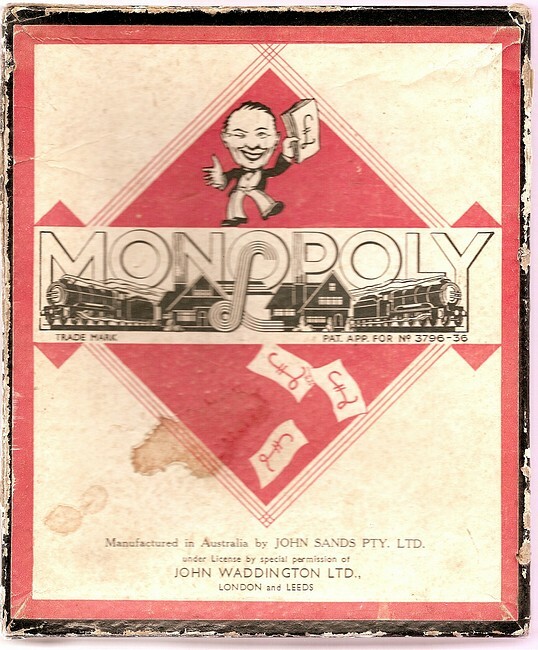 Then John Waddington sold a license to John Sands in Australia and others. Monopoly became very popular world wide. 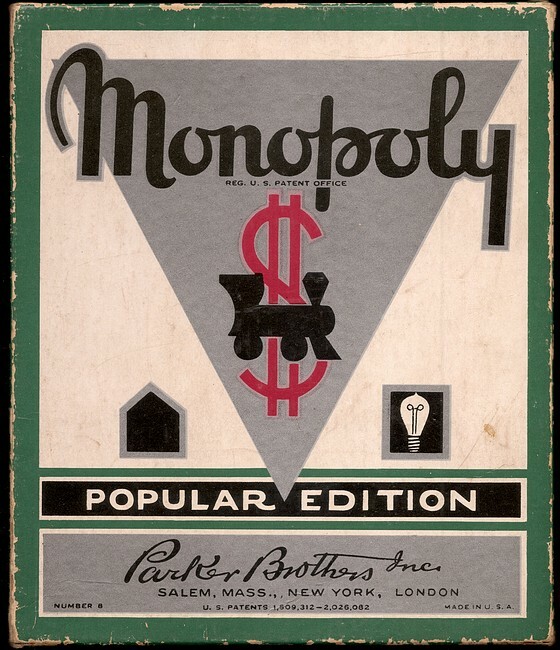 Canadian Monopoly games pretty much followed the Parker Brothers game designs, using the same box and board designs, and Atlantic City street names for properties. The British games had completely different game designs and used London street names for properties. 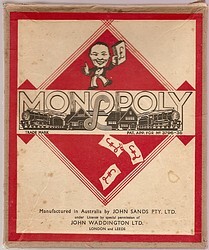 Australia used the British game designs and properties. Below are some early Canadian, British, and Australian game boxes. Here is a Deluxe Gold Edition Monopoly game from 1936 made in Australia by John Sands Co. 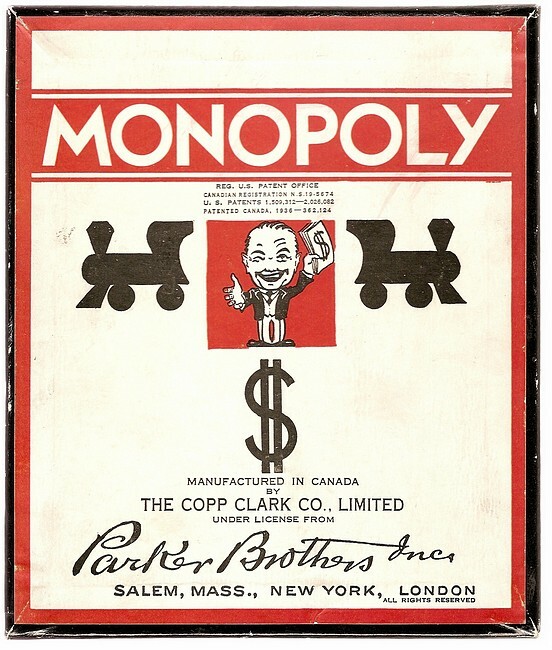 This version of Monopoly was also made by Parker Brothers in the U.S., John Waddington in the U.K., Copp-Clark in Canada, and in other countries. Each follows the same general pattern, but each has it's own character, as well. They are all very hard to find. 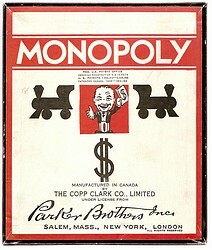 Parker Brothers sold a license to manufacture and sell Monopoly games in Canada to Copp-Clark in late February, 1936. Copp-Clark immediately applied for a Canadian patent for the game. 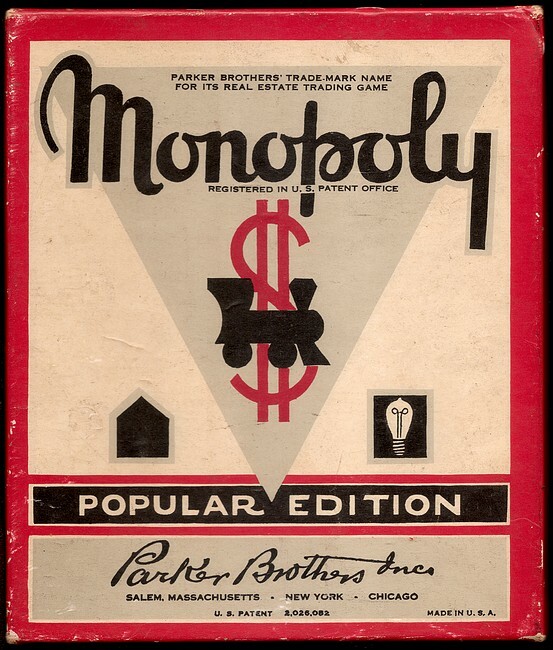 In November, 1936, the Canadian patent for Monopoly was approved. After that time, games were labeled with the Canadian patent 362,124. 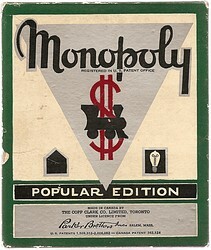 However, described here is an even earlier Canadian form of Monopoly in the white box. 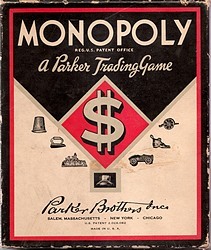 Shows CANADIAN PATENT APPLIED FOR and CANADIAN (Trademark) REGISTRATION APPLIED FOR on the game box, instructions, and game board, with reference to the early Parker Brothers dual American patents. This game with these legals is highly collectible! PLEASE NOTE: I saw another White Box Canadian Monopoly game offered on Ebay recently with Patent Applied For on the game board. The rest of the game parts had the usual Canadian patent and registration numbers.